Joy Creek Photo Archive (c) all rights reserved Use the evergreen Arctostaphylos densiflora 'Sentinel' as a specimen in a mediterranean border. As the shrub matures, older branches develop mahogany coloration. 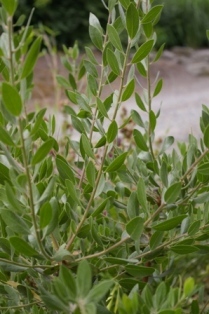 The thickened leaves are loosely adpressed to the stems, revealing their semi-glossy undersides while their downy, matte upper surfaces are somewhat concealed. The pink flowers of spring give rise to dark fruits in summer. Spring. 4 ft. x 30 in.